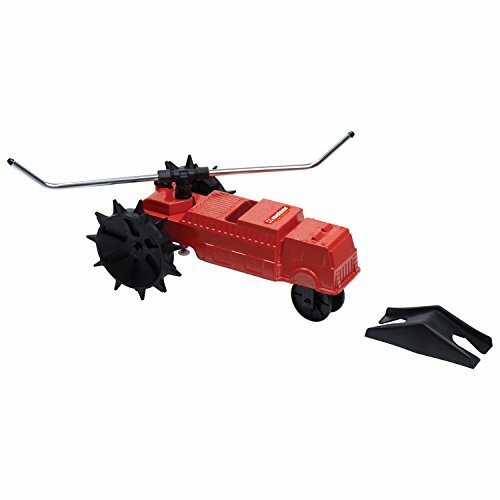 The Lawn Rescue Traveling Sprinkler provides the perfect solution for watering an extra-large area. Set a custom watering path with your garden hose and adjust the speed to easily water the entire yard. The sprinkler propels itself along the path to evenly water up to 13,500 sq. ft. of lawn. When finished, the automatic shut-off will stop the sprinkler. Made of heavy-duty cast iron, this sprinkler is built to last, adding life to your lawn for years to come. Melnor® will donate a portion of each purchase of a Lawn Rescue Traveling Sprinkler to the National Fallen Firefighters Foundation®. The National Fallen Firefighters Foundation® leads a nationwide effort to honor America’s fallen firefighters and support their families. Super large coverage area - up to 13, 500 sq. Ft. Backed by a Melnor Lifetime Limited Warranty. Melnor Stands behind their products. View More In Automatic Irrigation Equipment.